Sometimes we get questions about stevia leaf extract being natural or not, which we believe it is to 100 %. 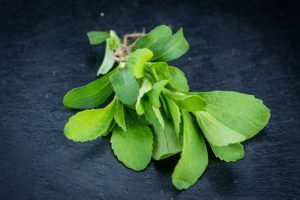 Recently, a new study concluded that steviol glycosides from the stevia plant are not altered during the extraction and purification process to make high-purity stevia extract. Which supports stevia extract as a natural ingredient. “These findings are significant because the natural authenticity of stevia sweetener has been questioned due to the purification process it undergoes. The fact that there is no change of the nine steviol glycosides in the provided samples from the original plant to extracted sweetener provides support for the natural authenticity of stevia sweeteners,” said Dr. Ursula Wölwer-Rieck, Department of Nutritional and Food Sciences at the University of Bonn, Germany. Stevia is extracted and purified from the stevia plant into a powdered sweetener form. The extraction process involves steeping the dried leaves of the plant, like a tea, and then separating and purifying the best tasting sweet compounds, the steviol glycosides. High-purity stevia leaf extract is approved in more than 150 countries, and over 200 studies support stevia’s science and safety. Since 2008, more than 10,000 products have launched globally with stevia. In 2016 alone, close to 3,000 products launched globally with stevia, with the beverage category growing by 20 percent and the food category growing by 9 percent. The research has been published in the International Journal of Food Science and Technology.